Are prebiotics helpful for SIBO? Prebiotics are often given a bad wrap in the SIBO sphere! If you have an overgrowth of bacteria, the last thing you would want to do is feed those bacteria with prebiotics, right? If SIBO was truly a bacterial problem, then I think avoidance of prebiotics through all stages of treatment may be your best bet. But, SIBO is not solely a bacterial problem. The bacterial overgrowth is a symptom of a much bigger problem. 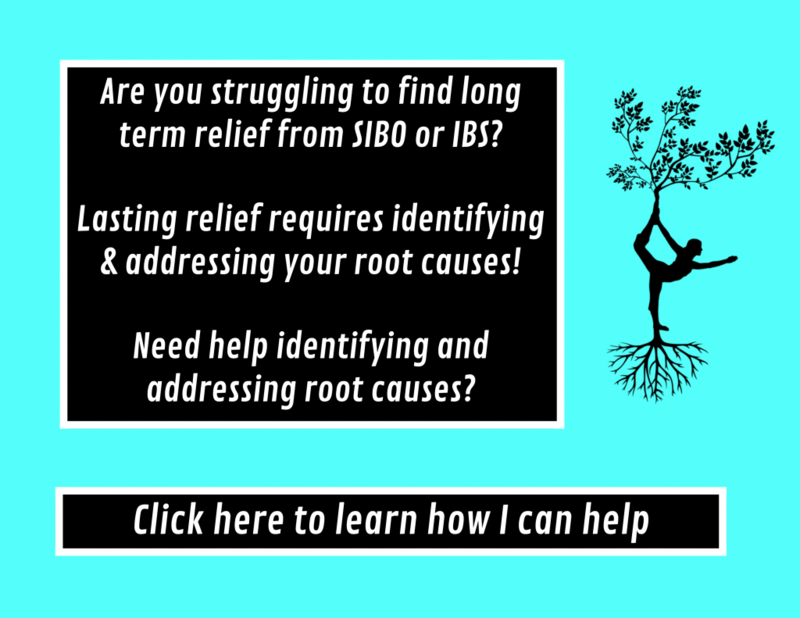 It takes truly understanding the root cause of your SIBO to determine if prebiotics should be included or avoided during your SIBO treatment. In this post, I would like to take a deeper dive into prebiotics to break down when they can be useful and when avoidance might be necessary. Prebiotics are defined as “a selectively fermented ingredient that allows specific changes, both in the composition and/or activity in the gastrointestinal microflora, that confer benefits.” In short, prebiotics are the food that feed your good bacteria. While you can buy prebiotics in a supplement, you can also attain them naturally from plant foods. In fact, supplemental prebiotics are just purified versions of the prebiotics found in plants. Almost all plant based foods have prebiotic fibers and compounds that can feed your gut bacteria. Foods with particularly high amounts of a prebiotic fibers are leeks, garlic, onions, asparagus, Jerusalem Artichokes, oats, wheat, beans and bananas. Consumption of prebiotics in the US is estimated to be several grams a day, which minuscule compared to analysis of our hunter gatherer ancestors which suggest the average foraging male was eating 135 grams of inulin (a prebiotic fiber) a day. Our ancestor’s gut bugs were eating like kings, while gut bacteria in the modern world are left to fight over scraps! Polyphenols, compounds found in plant foods, also have prebiotic effects. Polyphenols are a popular topic in the health and wellness world due to their anti-inflammatory and anti-aging effects in the body, but polyphenols’ positive effect on gut bacteria is rarely discussed. Polyphenols promote the growth of good bacteria while suppressing the growth of pathogenic bacteria. Polyphenols are found in high amounts in plant foods like berries, grapes, dark chocolate, turmeric, cinnamon, oregano, cloves, green tea and even wine! I knew wine had to have some gut benefits! In animal studies, supplemental polyphenols promoting the growth of a bacterium called Akkermansia muciniphila. This shift in bacteria prevented the development of diet induced obesity and metabolic disease when animals were fed high fat/high calories/lower fiber diets (like the standard American diet). Why are prebiotics important for both gut health and possibly SIBO recovery? Prebiotics are fermented by our gut bacteria to produce short chain fatty acids (SCFAs), which can have both local and systemic health benefits. In the gut, a short chain fatty acid called butyrate is the preferred fuel source for the epithelial cells that line the gut. These SCFAs can help maintain the integrity of the intestinal lining preventing inflammation and leaky gut. Above the gut lining is a mucous layer that serves as a protective buffer preventing direct contact of the epithelial lining with bacteria and toxins. This mucosa also serves as a habitat and food source for our colonic bacteria. When your mucous layer is thin, bacteria and toxins will come into contact with the epithelial lining and elicit an inflammatory immune response. The goblet cells that are responsible for this mucous layer rely on the SCFAs to maintain adequate mucous production. So, when you don’t eat prebiotic fiber, your goblet cells can’t produce enough mucous. Without fiber and mucous, the bacteria become ravenous, eating through all the mucosa and they will eventually start consuming your gut lining. This degradation of the gut barrier will not only lead to gut dysfunction, but system wide inflammation. GI inflammation and intestinal permeability is a root cause of many SIBO cases, because it leads to the breakdown of the nerves that are responsible for the intestinal motility. When we restrict prebiotic fibers in our diet (like many FODMAPs) we could be promoting this inflammatory response in the gut. SCFAs are also crucial in maintaining the acidity of the colon. Microbes are very sensitive to changes of pH in the colon. Lower colonic pH will inhibit pathogenic microbes and will promote the growth of good bacteria. By avoiding prebiotic and fermentable fibers, your colon can become much more susceptible to pathogenic overgrowth. A healthy and balanced large intestine is essential for stimulating the MMC/motility of the small intestine as I highlighted in this blog post. In animal studies, lactobacillus acidophilus and bifidobacterium strengthened the MMC response and increased transit through the small bowel. Prebiotic supplements like GOS or FOS really stimulate the growth of these MMC strengthening bacteria. SCFAs are also water soluble and absorbed into the bloodstream. Butyrate not only feeds the cells lining the GI tract, but it also has brain boosting effects. Butyrate can change gene expression in the brain that prevents neurodegeneration and promotes regeneration. SIBO causes inflammation in the gut. As I discussed in my brain-gut axis post, when the gut is on fire, the brain is also on fire! Brain fog, memory problems and poor focus are common SIBO symptoms caused by the inflammation in the brain-gut axis. Chronic brain inflammation will result in reduced vagus nerve stimulation, impaired MMC/motility and impaired gut barrier function. It’s impossible to heal from SIBO when your brain is inflamed. Prebiotics can increase the butyrate in the blood that can help keep the brain healthy, which is essential for a healthy gut. There are very few studies that have been conducted to test the efficacy of using prebiotic supplements for SIBO. Most of the studies that have been conducted are small and combined the prebiotic with a probiotic (symbiotic). Antibiotic therapy combined with a prebiotic/probiotic therapy was more successful at producing a negative hydrogen breath test and reducing symptoms compared to the placebo group who received the antibiotic therapy alone. An additional study showed that both prebiotic and probiotic supplementation after antibiotic treatment showed positive outcomes. I also think its important to look at studies looking at the efficacy of prebiotics in IBS treatment since SIBO experts estimate that 60% of IBS patients have SIBO. In one single blinded, randomized controlled trial, IBS sufferers that were given GOS (3.5-7g) for 4 weeks experienced an improvement in symptoms. Another randomized, double-blind study of healthy individuals with mild functional bowel symptoms demonstrated that regular consumption of short-chain FOS (5 g/day) reduced the frequency and intensity of digestive symptoms and improved intestinal discomfort and QOL compared with placebo after 6 weeks. Prebiotic treatment also resulted in an increase in Bifidobacterium levels compared to the control group (proof that the prebiotics were feeding the good guys). The IBS population is known to have low levels of the MMC stimulating Bifidobacterium compared to healthy controls. Bifidobacterium are also essential for reducing intestinal inflammation and strengthening the gut barrier. I hypothesize that the prebiotics helped the IBS patients studied by stimulating the growth of Bifidobacterium resulting in a decrease in intestinal inflammation and a strengthening of MMC activity. Research also shows that prebiotics administration will usually cause more gas upon initiation, which should decline as the microbiota shift and adjust. This increase in gas may scare SIBO sufferers away. We already have so much gas as it is! But, prebiotic benefits usually require moving through this adaptation period and then experiencing a decrease in gas/symptoms after the bacterial shift. When using prebiotics, the calm happens after the storm. Which SIBO patients may not benefit from prebiotics? I want to make something VERY clear. While I think prebiotics can help some people who have SIBO, they are not right for every SIBO patient. I suspect that patients with obstructions, ileocecal valve issues and severe brain-gut axis dysfunction may not tolerate prebiotics well. For individuals with severe gut-brain axis issues, it may require some time repairing and supporting the brain gut axis before prebiotics can be tolerated. You can repair and strengthen the brain gut axis with vagus nerve exercises like gargling, gagging and singing. Both herbal and pharmaceutical prokinetics can also support MMC action and may increase your ability to tolerate prebiotics. Timing can also be really important. Treating SIBO with antibiotics (whether herbal or pharmaceutical) should probably be taken before or during supplementation with prebiotics. The antibiotics can help lower the bacterial load in the small intestine allowing the prebiotics to feed large intestine bacteria rather than the overgrowth in the small intestine. If you still don’t tolerate prebiotics following antibiotic therapy, you may still be dealing with some dysbiosis in the large intestine, high antibodies from food poisoning, brain gut axis issues or other digestive breakdowns that you need to address before you can tolerate prebiotics. But, even if you don’t tolerate prebiotics right now, that doesn’t mean you should avoid them forever. I personally believe one huge goal of SIBO treatment should be to rebalance the bacteria in the WHOLE GI tract. Because as I have said before, the small intestine can’t function properly without a healthy large intestine. Therefore, prebiotic fibers are essential for keeping the large intestine and the small intestine healthy. Tips on how to use prebiotics for SIBO treatment? SIBO sufferers are often more sensitive to prebiotic fibers like FODMAPS compared to someone with a healthy gut. As I discussed earlier, the research shows that prebiotics can cause a rapid shift in bacteria that can initially increase symptoms like gas and bloating. With this in mind, SIBO sufferers should approach prebiotic supplements with some caution. It is best to start low and slow. Starting slow is especially important if you are transitioning from a FODMAP or low fiber diet. I know one of my favorite functional medicine practitioners, Chris Kresser, has discussed how he usually starts his patients on like 1/8 of a teaspoon when the general dosing is a teaspoon. If you can tolerate that then you can probably increase the dose from there. Same goes for prebiotic foods! Start with small doses of fiber rich/prebiotic foods (like a bite or two) and build up to higher amounts. Will make for a much smoother transition. I think it is natural to experience slight discomfort or increase in symptoms when starting a prebiotic supplement or increasing prebiotic foods in your diet. But, that mild discomfort should pass relatively quickly. If you are having unbearable discomfort when starting a prebiotic, you may have overdone it and you should lower your dose. I have personally over done prebiotics before in my healing journey. Usually backing off for a few days and starting on a lower dose helped me readjust. While you don’t necessarily need to supplement since virtually all plant foods are prebiotics, a good prebiotic supplement can help jump start your healing progress. Personally, I like Klaire Labs BiotaGen supplement. I tolerated it well and I liked that it had 3 different types of prebiotic fibers, which allows it to feed more types of bacteria. I have heard through the grape vine that some people tolerate GOS better than FOS. The Taymount clinic where I had my FMT done recommended a GOS powder to help feed my new bacteria post FMT. Here is a link to a good GOS supplement. I also don’t think you need to take prebiotic supplements for the long term. Eating a wide variety of prebiotics in your diet once your gut has rebalanced should be more than adequate to keep your gut healthy and happy. Sending in some good guys with the prebiotics can further boost the gut repairing effects. Choosing the right probiotic to pair with your prebiotic can be very important. MegaSporeBiotic is by far the best probiotic I have ever tried and I’ve heard great anecdotal support for this probiotic from others in the SIBO community. I have already written about MegaSpore extensively here if you’d like to learn more. When you start prebiotics, it is important that you listen to how your body is responding to them. If you are feeling good at a low dose, don’t hesitate to titrate up. If you feel extra symptomatic, you should titrate down or take a break from prebiotics for a little while. You should view prebiotic foods/supplements as an experiment. It may take a little trial and error to determine if prebiotics are right for you and what dose to use. The Bottom Line: Are Prebiotics Right For You? Maybe! As with everything in the SIBO world, it varies from a case by case basis! Prebiotics have been shown to have positive outcomes in both SIBO and IBS studies. Prebiotics theoretically can help with SIBO by stimulating the growth of Bifidobacterium, which can correct colonic bacteria imbalances, lower inflammation in the GI tract and help repair the brain-gut axis. But, some SIBO sufferers are hyper responders and prebiotics might not be right for them at this point in their treatment! I’d love to hear your experiences with prebiotics!! Please leave a comment below. Also, please like the SIBO Diaries on Facebook to never miss a post! Just a disclaimer the information in this blog should not replace the advice of a licensed medical practitioner. Great article. I am currently doing this type of treatment with PPGG, Bimuno and lactulose as well as selected probiotics and fermented foods. II have very mild IBS and depression/anxiety. I took Bimuno – a prebiotic – and found that my mental symptoms got much worse within a couple of hours. I stopped taking it and returned to ‘normal’. I repeated the experiment a month later and found the same thing happened. Would you think that suggests I have SIBO? Hi John! When you took the Bimuno, did you just take one dose and then stop? Hi, I am relatively new here. I really appreciate your body of work. Treating SIBO actively. My GI had me complete 2 rounds Xifaxan, 14 days each. I am now on herbal protocol. I am bloating with absolutely everything I eat. My bloat is about 8 inches taking my waist from 25 to 33 inches. Needless to say this is painful. With your experience if I’m consuming only water and my herbals in the morning on an empty stomach and still bloating, could that just be Allicin or garlic creating a prebiotic feeding, and thus the bloat? Hi Jennifer, it could be the allicin having a prebiotic effect. It is hard to say for sure without knowing more about your case. Did you do the two rounds of antibiotics back to back with the herbals? Thank you Amy. I started herbals after completing 2 x xifaxan. GI okayed the herbals. I copied that herbal protocol from Dr. Siebecker. Ahhh I would say that doing the antibiotics back to back with the herbals may be creating some problems downstream in the large intestine, especially if the antibiotics and herbs are not helping with the bloat at all. This is just a guess though. How long have you been on them? I can’t tell you what to do since since I don’t know the ins and outs of your case. But, I can give my general opinion that antimicrobials serve a purpose in SIBO, but they have a diminishing rate of return. The longer you stay on them, they stop working and they can even make matters worse.